Komatsu Industries Corp the operation monitoring system "KOMTRAX"
This is the operation monitoring system to view the machines all ocer the world through the Internet. It's standard equipment on all industrial machines by Komatsu. Wastful Operation hours could be reduced. You can find real-time status of the machine operating all over the world. You can find inefficient or idle machine easily from a globally coherent standpoint of view. Man-hours for control can be reduced. You can grasp the operation status of machine statistically, which makes your job control and record calculation more efficient. The system is especially useful to control the overseas plants that require high travelling costs. You can see part number and operator of current production. Since current “product number” and “operator name” are displayed, you can see not only operation status of the machines but also attendance of workers. You can see alarms on the machine. Interruption and maintenance status of the machine are indicated on the operation bulletin. Since information is updated every 5 minutes, you can always check the latest status. 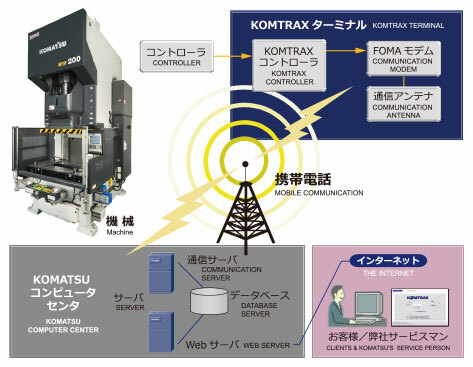 KOMTRAX is a system developed by Komatsu to check machine information remoiely. It supports you with operation and maintenance control of your machines collecting their operation and warrning information. Individual machine is connected to a special device called "KOMTRAX terminal." A communication modem is equipped on the KOMTRAX terminal and transmits the data collected from the machine to a server by data communications. The system on the server stores the data sent from the machine and provide them to our clients and to our service representatives via the Internet. This is the operation monitoring system to view the machines all over the world through the Internet. Listed operation status of your machine is displayed. You can see the operation status of your nearby and remote machine just sitting at your office. Operation data are graphically displayed in a time series. You can see transition of operation status and production numbers. Actual outputs per each part number are totaled. You can know production numbers, operation hours, preparation hours etc. per each part number. The KOMTRAX reports daily production results. It can output daily reports aggregating correct operation and production information of each machine. Replacement of maintenance parts and information on inspection are controlled. Contents of every failure and alarm on each machine are memorized. Komatsu's service representative can also check them remotely to support clients over the telephone easily. We especially like the service of "KOMTRAX" operation control system. We were checking operation rates of all machines in the company, which we can get with the "KOMTRAX" easily to raise motivation of employee. In addition to checking operation rates, it provides us with other services such as telling about maintenance. We are going to utilize those functions to minimize stopping period of machines as much as possible. We can see what a machine is doing and if maintenance is required at a glance, and manage jobs from all other places that have a Internet environment. 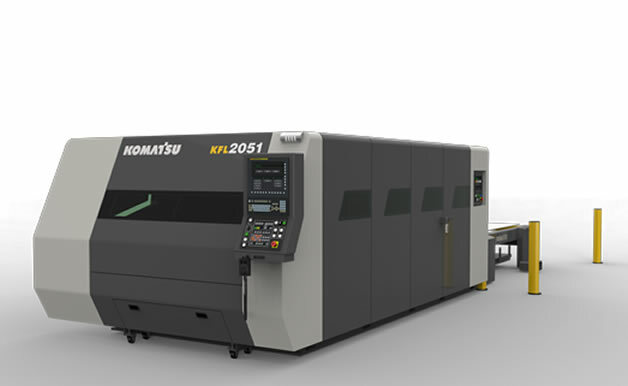 We have introduced the "KOMTRAX" to visualize production rates. We are analyzing causes of low production rates and checking machine failure and other reasons of stopping. 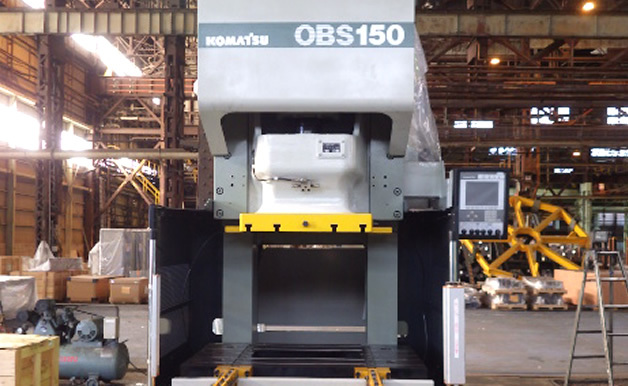 Installation cost of the "KOMTRAX" is cheap and no operation charge is necessary, which is attractive for installing on all machines in the plant. 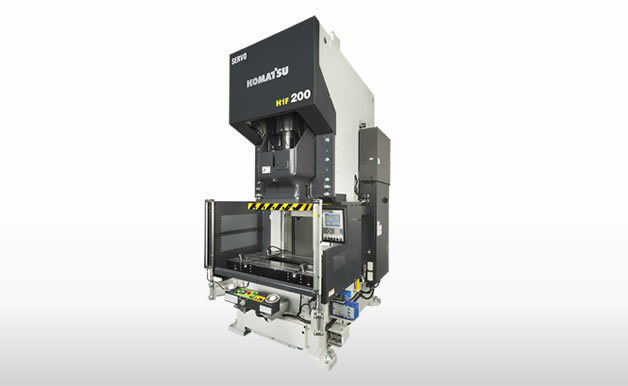 We introduced the "KOMTRAX" to obtain correct production numbers of each product. We can now automatically count numbers, which previously we calculated from manually written report by operators. It helps that it can be installed on machined made by other manufacturers to introduce in whole plant.